In one scene of Itami Juzo’s Tampopo (1985), Goro takes Tampopo and her son, Tabo, to meet his old friend, the doctor. Goro hopes that the doctor will join him in helping Tampopo become the greatest ramen cook in Tokyo. The doctor used to be a successful and wealthy man. He is a gentleman scholar with boundless knowledge and refined tastes. Unfortunately, he was cheated by his business partner who stole all his savings as well as his wife. He ended up with the homeless on the streets and apparently has taught his new friends the conneusieurship of fine foods. At this meeting, students of the doctor show off their knowledge and skills by discussing their culinary adventures and delights. One vagabond asks Tabo what sort of food he would like to eat. ‘Omurisu’, he replies. (That is omelette with rice and other things.) What follows is a Buster Keaton-type scene (with only music and sound effects) where the vagabond takes Tabo into a restaurant kitchen to make him the dish artfully avoiding a security guard at the same time. 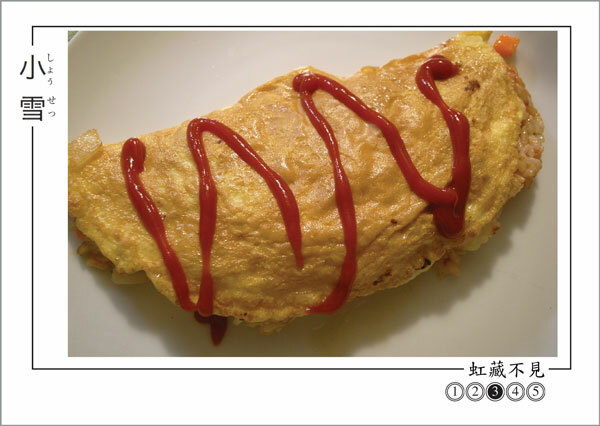 “omurisu” – is that a japanesation of omelette-rice? it’s cute. when i first saw this photo, i thought it was a vegetarian cornish pasty. “Omurisu” is omelette morphing into “omu”オム joining with “risu”ラス (u is silent) which is the word Japanese uses when refering to a ‘foreign’ use of rice (usually its gohan ごはん – with ‘go’ being a respectful prefix). Redmond thought it looked like a cornish pasty too. As mentioned, I made mine a bit fat by over stuffing it. The traditional home-made ones are more slender, some with elaborate mayonise and tomato sauce lacework. It can be made into a vegetarian dish! mmm – maybe lucas will make me one for lunch! Get the recipe online or simply just watch the scene from ‘Tampopo’ again. The omurisu in the film is a slightly differnt version – perhaps more avant-garde, like the film.